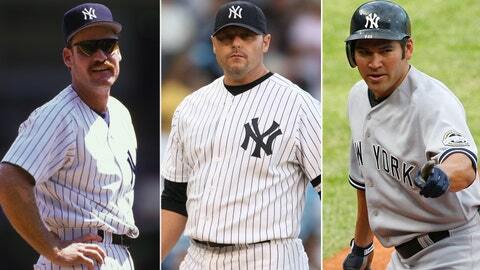 Wade Boggs, Roger Clemens and Johnny Damon played for the Red Sox and the Yankees. Red Sox fans are telling themselves that the Yankees overpaid. Jacoby Ellsbury, as good as he is, is not worth $153 million over seven years, and surely his legs will fail him and his power won’t return to satisfy such a contract. But it still hurts that the homegrown center fielder left the Red Sox for the rival Yanks. Ellsbury, a longtime Boston fan favorite, has become the latest Red Sox player to switch sides in the American League East rivalry. While some defections have been innocuous, such as Kevin Youkilis simply needing a place to work after being traded by the Sox, others have been downright painful. The Yankees have made other big-dollar moves this offseason, showing they’re not content to get kicked around in the division while the Red Sox hold up their hardware from this past season’s World Series win. The Ellsbury deal, no matter how smart it looks financially for the Sox, stings all of Red Sox Nation. Ellsbury went after the big bucks and now will be associated with the Bronx Bombers as much as he was known for winning two championships with Boston. Where does that rank him among the top 10 Red Sox who have joined the Evil Empire?